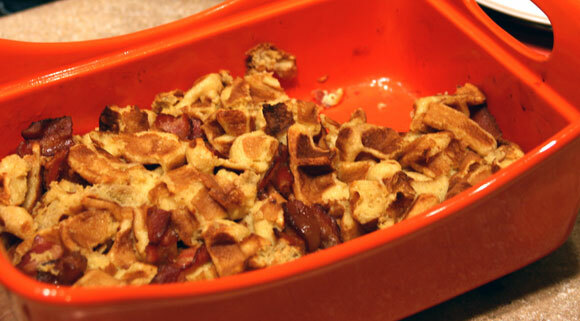 Maple Bacon Waffle Bake is great for breakfast, dinner or brunch and would be perfect for Christmas monring. Preheat oven to 375°F and lightly grease a casserole dish. If using frozen waffles, toast them until crispy. If preparing homemade waffles, cook them until crispy before assembling this dish. Break the waffles into 1 inch pieces. Cut the bacon into 1-2 inch pieces and cook on medium heat until crispy. Drain on paper towels. Beat together egg yolks, salt, milk, whipping cream, maple syrup and vanilla in a large bowl. Add waffle pieces and bacon. Fold together until evenly moistened. Most of the liquid will absorb. Pour mixture into baking dish and cover with foil. Bake for 1 hour. Uncover during the last 10 minutes.